Unity is a worldwide organization more than a century old. It teaches and emphasizes a new way of thinking and a new way of living. Unity has been described as a common-sense religion or as practical Christianity. 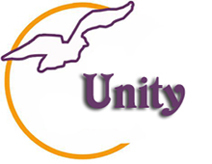 The Unity teachings have broad appeal to people of all faith, Christian and non-Christian. Unity recognizes the value in all the world's great religions and we celebrate the richness of diverse religious beliefs and expression. Our churches attract people of all faiths, and it is not unusual to find Christians, Jews, Muslims, Hindus and Buddhists all worshipping together, celebrating God and life. Unity accepts the Bible as its main textbook of truth and we interpret it spiritually, literally and metaphysically. Unity explains the Bible and its lessons as they relate to you today and to your spiritual growth and life experiences. Unity also accepts and reflects statements of truth from many different avenues, for we believe that God is too great to be contained in just one book or one concept or one philosophy. We believe that God is absolute good, and that God is present in all creation. Unity proclaims the divinity of Jesus but assures us that like Jesus we are each a child of God. Unity acknowledges Jesus as teacher, way-shower, and elder brother, but we worship the Christ, God's spirit in humankind, rather than the man Jesus. Unity is most unique in that it has no creed or requirements, little concern for dogma or ritual and allows us the freedom to grow spiritually at our own pace and to evolve to our own working philosophy of ideas and beliefs. Unity is an open-ended search for truth where people of all races, religions, social and economic backgrounds are welcomed with love and dignity. We accept individual responsibility for growth and that requires commitment. All of our teachings at their deepest levels are designed to show the way to the source of all good, which is unselfish service to humankind, our brothers and sisters. Unity is an extremely positive approach to life. We emphasize health, joy, peace of mind and prosperity, seeking to accept and accent the good in all people, in every area of life. Unity also emphasizes joy in everyday life. As a result, we are happy and enthusiastic about living. Unity believes and teaches that each one of us is responsible for becoming the very best human we can be, the very best Me that I can be. Unity believes that as we develop individually with a consciousness of self-esteem we can then give more of ourselves to others, as from an overflowing cup. Unity states that the connection between God and us is direct, that communion in unity between us and God is only awaiting our discovery, a personal relationship within us, with the God of our being. Unity is a beautiful way of life. If you are looking for a place that will accept you and challenge you to be the very best that you are, then come grow with us.